We are delighted to have you visit our website and hope that you will come by and study God's precious Word with us. We have classes for all ages, and we fill our lessons with Holy Scripture. Something that is lost in the world is that true Christianity is a war which is waged against error as well as self-will. The religion of Christ is not for those who seek common ground with error. It is not for those given to political correctness. Because the gospel is unchanging, it is not for those who are given to change or for those seeking popularity among men. It is not for those who want to redirect the path of the cross to a social gospel outreach filled with the appeal of entertainment, and frolic (1 Cor. 11:22, 34). It is not for those who will not respect the rules Jesus has set forth and given to us by the apostles (Matt. 28:18-20). There is a very real reason why we call him “Lord.” Finally, because Christianity calls us to own a servant's heart, it is not for the proud in heart. The Son of God’s religion is for those who will lovingly and yet firmly walk in the steps of the Lord (1 Jn. 2:6). It is for those who are trained by discipline and while reaching for the forgiveness of sins will also be willing to extend forgiveness to those who have crossed them. Pure Christianity is for those who seek the challenge to shape their life to overcome evil with good (Rom. 12:21). Even as newborn babes are to grow so Christianity is for those who are ready to move outside of their comfort zone to grow into the person Christ wants them to become. It is for those who love the Lord more than any relationship that exists on earth (Lk. 14:25-27). It should be apparent that Christianity is a war of the soul both internally and externally (1 Pet. 2:11). "or though we walk in the flesh, we do not war according to the flesh. For the weapons of our warfare are not carnal but mighty in God for pulling down strongholds, casting down arguments and every high thing that exalts itself against the knowledge of God" (2 Cor. 10:3-5). 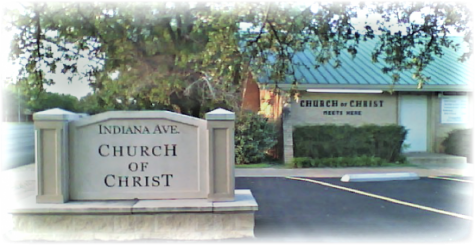 The Indiana Ave. church of Christ seeks to do the work of the church as is defined in Scripture. Our appeal to men is not through entertainment or emotional filled skits and plays. Rather, we give ourselves wholly to the authority of the word of God in the Berean spirit of Acts 17:11. "These were more fair-minded than those in Thessalonica, in that they received the word with all readiness, and searched the Scriptures daily to find out whether these things were so" (Acts 17:11). We are not operated by the dangerous denominational one-man "pastor" system where one man rules the church and seeks to become the authority of the church. Christ alone is our head (Eph. 4:15). We do not find any use in the wearing of religious titles (father, pastor, reverend, etc.) to elevate a man. Pride leads to a fall, and we seek to be simply "brethren" and "children" of God. We invite everyone to ask questions. We encourage all to investigate the Scriptures and compare what you read to what you see and hear practiced today. The truth does not fear inquiry or analysis. We seek not to think beyond what is written and so our Bible classes and sermons are actually filled with Holy Scripture (1 Cor. 4:6). You are cordially invited to bring your family and friends and visit with us. We will be happy to answer any questions you might have and will treat any and all visitors as an honored guest. Can we study with you?